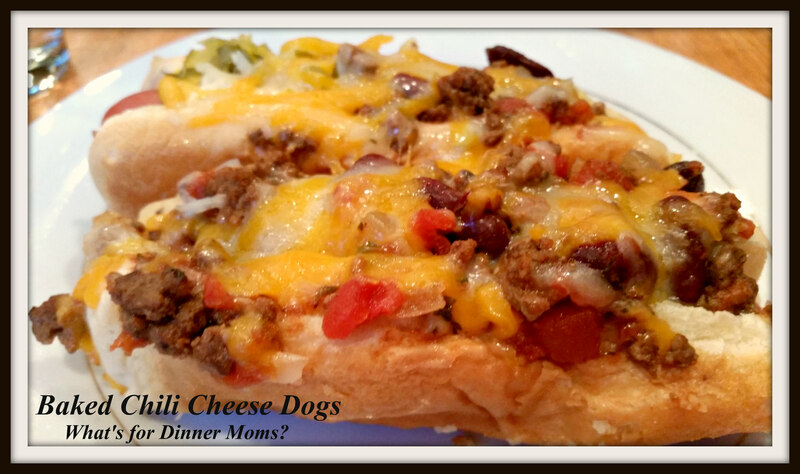 Baked Chili Cheese Dogs – What's for Dinner Moms? I had a meeting last night so I needed a meal that could be put together quickly and easily once I got home. Once again I looked to my slow cooker. Most of the meal could be made ahead of time and just assembled when I got home or it was so easy I could have had one of the children make them. This would also be a great recipe for a football party or a teen party. The recipe can be customized to make from 6 to 60, if you like. The hot dogs could be kept warm in a chafing dish or warmed oven until ready to eat. These were a hit! They were simple and had a really great flavor. I was really worried about the buns getting soggy but they were crunchy on the outside and soft on the inside, just perfect. 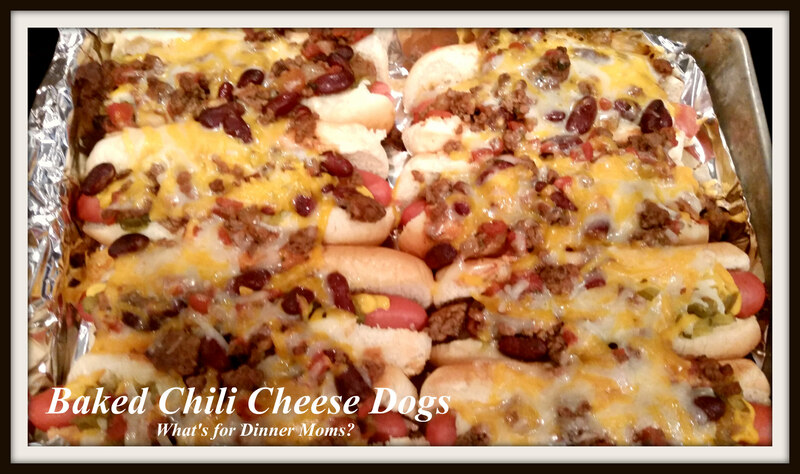 Make your chili as hot and spicy as you like to personalize the hot dogs. The mustard and relish just add another layer of flavor. Sprinkle onions over the top if you like. Serve with a green side salad to make a meal. These can easily be made gluten-free by using gluten-free rolls. Mix all ingredients in bowl of slow cooker. Cook on low for 6 hours. Stir and taste, adjusting spices as necessary. Preheat oven to 350 degrees. Cover a 13 x 9 baking pan with aluminum foil to help with clean up. Butter rolls inside and out (tops and bottoms). Sounds weird, but it works. Place rolls in pan. Add raw hot dogs to rolls. Add mustard and relish to tops of hot dogs as you normally would. Add chili to hot dogs and then sprinkle with cheese. Tent pan with aluminum foil. Bake for 20 minutes. Remove foil and bake for 5-10 minutes more until hot dogs are slightly browned on top. Remove and let sit for 3-5 minutes before serving. I nominated you for a blog award. Check it out here. Oh my they look good. I’d omit the dog and eat the rest, maybe add sausage instead of a hot dog. I’ve never like the taste of Hot Dogs, but my kids would love these! I love crock-pot recipes! This post I’m moving to my recipe folder! Thanks, hope the kids like it. Sausages may be good too. I Crock pot all the time. But this is a new one and I am absolutely adding this to my list of to do! Living in AZ I will try anything to stay out of the kitchen during our very long hot summer. I think summers are bad in MI. I can’t imagine cooking in AZ!